Run 2 (2015-2018) of CERN LHC operations ended. There will be no physics experiments for the next 2 years. CERN accelerator complex will be upgraded during the long shutdown between now and spring 2021. During Run 2 each proton was accelerated to 6.5 Tev. The center-of-mass energy of a proton-proton collision was 13 Tev. The beam itself contained much more energy of course because each counter circulating beam contained more than 2.8 x 10^14 protons. This means that the total energy stored in the beam was high enough to melt 500 kg of copper. That’s why the LHC beams are dumped in a very controlled manner after data taking sessions. 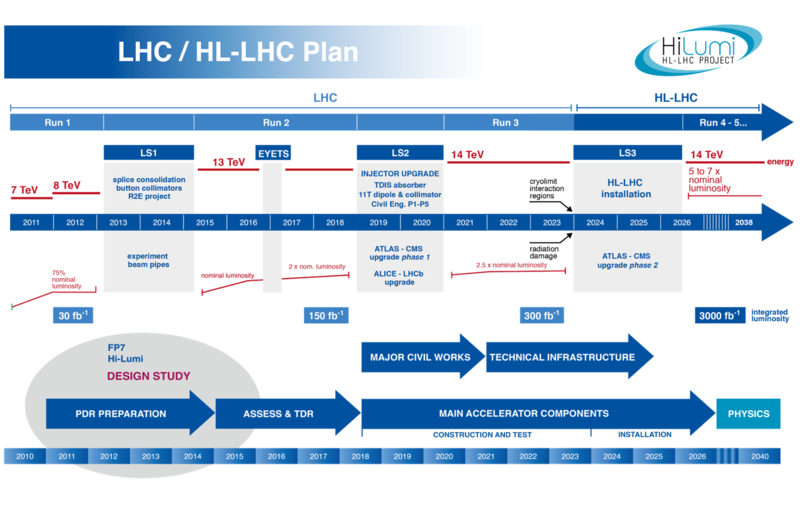 You can also examine the integrated luminosity delivered during Run 2 (years 2015, 2016, 2017, 2018) from the links provided in my post titled “Updated links: LHC (Large Hadron Collider) Operation“. More details of LS2 can be found in this document as well as this one. This entry was posted in physics and tagged CERN, LHC. Bookmark the permalink.